I have been having trouble hearing in one ear lately. There is a metallic buzz in my right ear that makes people in real life and on TV sound like Cybermen from Doctor Who. And if you’re a Doctor Who fan, you’ll know that constantly hearing Cybermen is most definitely a worrisome experience. 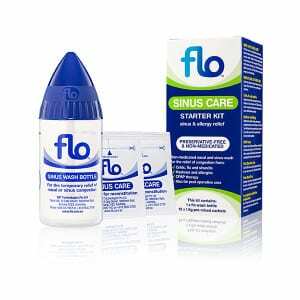 So, I visited my doctor and, based on her theory that what I had was a buildup of mucus in the sinus next to that ear, she prescribed some ear drops, and a nose spray, and a weird thing. To the right is a picture of the weird thing. As I explained to Lady Devotea, it’s a device that cleans your sinuses by shooting liquid through them. “Like a Neti Pot?” she asked. “What’s a Neddy Pot?” I asked, given that I still wasn’t hearing well. “It’s like a teapot, but you pour it up your nose to clean your sinuses. They are from Victorian times”, she explained. And just like that, this blog post became inevitable. I’d never heard of the damn things! In my mind, they were delicate Victorian Bone china contrivances with teapot-like floral designs, but instead they are often quite utilitarian, and sometimes have a barb on the end of the spout to stop water flowing back. It turns out that, rather than being the province of those erratic but lovable Victorians, it’s both a practice still popular today and very, very old. 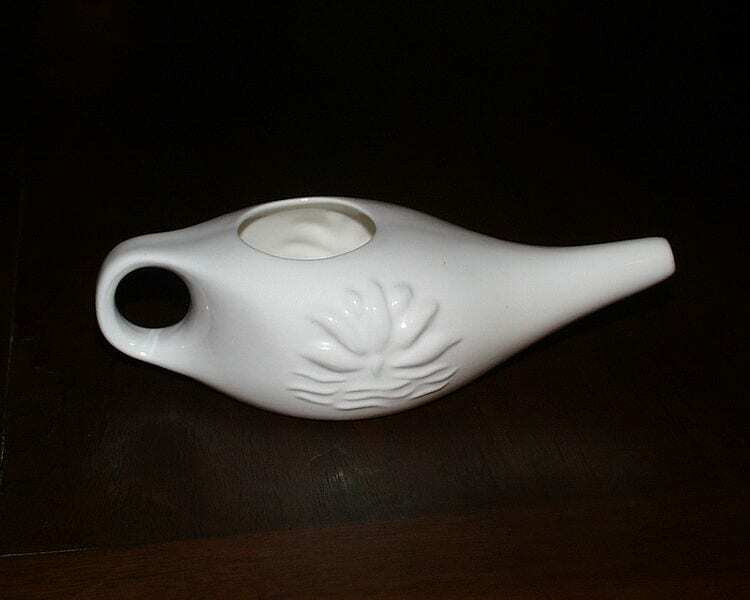 A little research has informed me that neti pots were originally a part of ancient Ayurvedic cleansing, where undertaking “Jala Neti” daily is considered essential. 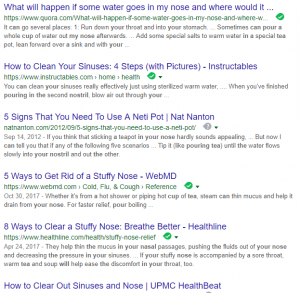 An alternative is “Sutra Neti”, which involves passing a piece of string through your sinuses, so I imagine those who had to perform Jala Neti daily were wise enough to know when they had the best option. It’s also quite concerning that when people use unsterilised tap water, it’s a really good way to get amoebic meningitis and die. The modern ones have a powder that you mix with boiled water. The powder is Sodium Chloride, Potassium Chloride, and Glucose. Basically add Pineapple juice and you’d have a workable Sweet and Sour Sauce, but I digress. Nobody wants to inhale Sweet and Sour Sauce, not even for a bet. Finally, let’s deal with the obvious question* – one has to wonder “What about tea?”. Can I pour tea up my nose? It’s sterile, warm and full of really good stuff, as long as I let it cool a bit. I’d have to say that is doesn’t seem wise to me. Now, you may expect a tea blogger to risk life, limb and nasal cavities in the pursuit of a tea blog, but hey, I’m not Geoff Norman. So, I googled “Can I pour tea up my nose, et voila! It appears the Internet is on the same page. But really, why waste the tea? If it’s a Rohini Enigma First Flush, then it’s a waste, and if it’s a supermarket teab*g, then it’s not worthy of your nose. However, I do think all this has led me to the possibility of a stinging comment: The next time I taste a tea that is just plain rank, I can say “I think you are getting your teapot and your neti pot mixed up”. With a smile of course, and knowing that whatever they say, I’ll probably not hear it, because a week of proto-Sweet and Sour Sauce up my nose has done bugger all to fix the problem. Now I have to run because I hear some Cybermen coming. Allons y!